And there is glorious comments thread here for those who relish grammar pedantry that only teh Internets can unleash. @pansons Speaking of words and stuff, you saw this right? Call me pro-Oxford comma. Is it really too much to ask to link to the original image source? Thanks Adelai – link added, and very happy to do so (I’d not come across the original, so delighted to be able to credit the clearly very talented ÆFerg!). 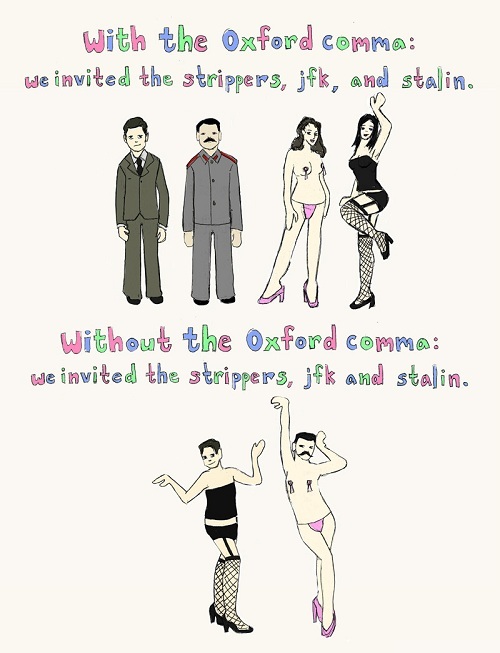 If you write it "jfk, stalin and strippers" you still don't need the stupid oxford comma. What you mean is people will PROBABLY figure out the meaning of the sentence. With the second comma, there is no chance of confusion. Haa that song popped into my head when I saw this blog post. I always thought this was named the Serial Comma. Never heard of 'Oxford Comma'. The second picture only makes sense if you use a colon instead of the comma. Because the oxford style guide uses it I guess. Why is it "stupid?" It's stupid for you to randomly dislike it because you think it's 'un-American,' to use it. it would also make sense if you used paretheses 'the stripped (jfk and stalin.) Even if that might not be grammitcally correct, if it's fiction it doesn't matter, i've seen tons and tons of published works of fiction in college textbooks that use punctuation and grammar wrong. But I totally get what you mean. I think it works all three ways though.